2016 has seen two sites appear with names associated to slot games, combined with the word Wild, after the recent release of Wild Slots. However, unlike it’s brother in name, Wild Spins is a site that is not exclusively dedicated to slot games, although (as the name may suggest) that particular game type does take centre stage here. It is not Wild Slots that this site seems to have taken inspiration from though, as it is hard not to notice that this site looks a lot like another online casino, and that casino is Casumo. Casumo is a very popular site, which is not easy considering how highly competitive the online casino market is, so taking influence from the site is not necessarily a bad idea, but a new site on the scene has to stand out, and echoing another site quite so much is not really a way to create the sensation of originality. That’s not to say Wild Spins doesn’t have anything going for it, it’s an easy to use site with an equal focus on mobile and desktop players, but is there enough in terms of content to make this site look tempting despite the number of rival sites available? Pastel colours are the main theme here, although some other colour scheme can be seen in the rolling banner images across the top of the screen. The most impressive part of the design here is the minimalist approach, it feels like there’s a lot of space here without ever seeming like too much. This means that information is easy to find and simple to read, a boast that many other sites cannot match. The current popular trend of showing thumbnails on the homepage with popular games from the site available in one click has been taken up a step here, with the ability to switch between categories including new games, jackpots, casino, mobile, all games, and more. As mentioned earlier, this is a very simple site to use, there has been a lot of effort put into the navigation here, customer service is clearly the most important aspect of the Wild Spins site, and that makes it very enticing, especially to new players who are still learning their way around the online casino world. 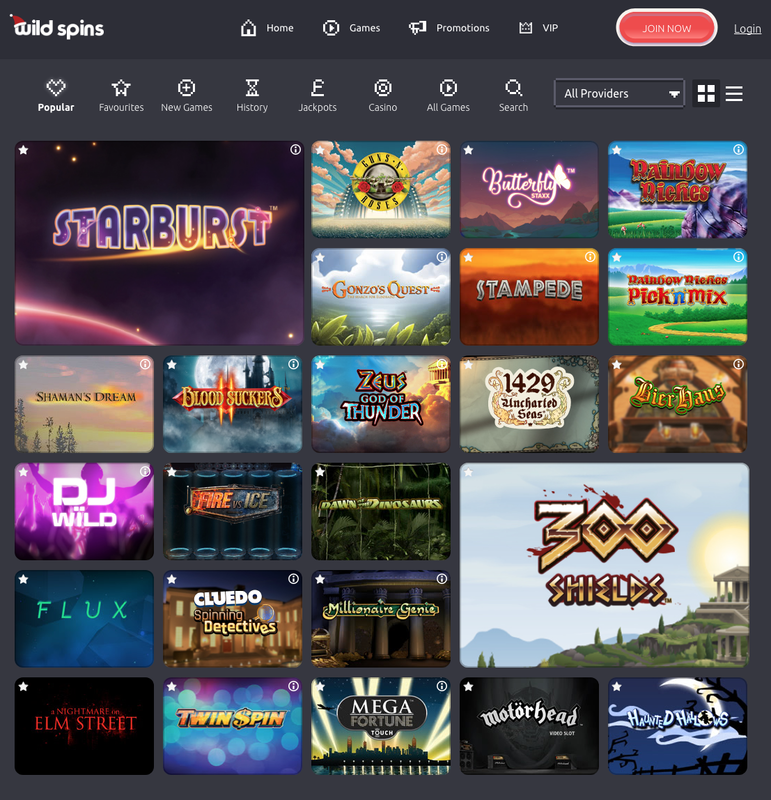 If you like variety in your gameplay, you’re going to find a lot to like at Wild Spins, with titles being provided by the likes of 888, Eyecon, IGT Interactive, NetEnt, NYX Gaming, OpenBet, PariPlay, SG Gaming, and Williams Interactive. This impressive and wide ranging collection of software providers offers a lot of choice to players, something that is perhaps the most important factor in the success of a site in the modern market. Wild Spins players who like their slots will not be disappointed with the options available, able to choose from new releases such as 7s To Burn, Aloha! Cluster Pays and more, alongside classic titles including Fluffy Favourites and Starburst amongst a plethora of others and a good number of jackpot slots thrown in for good measure as well. If you are more in favour of table and card games, you will find some choices here as well, although less than slot players will. Roulette, keno, baccarat, various forms of video poker and more are available at Wild Spins, but a few more would certainly not go amiss. A decent site, with a good amount of options for mobile players and a good look to it, but one feels like there could be more on offer here, and hopefully there shall be as the site finds its feet a little more.